Dr. Bill Molle won two Pacific Coast Championships in Class "H" Modified, driving this #66 Fairchild Panhard Special. "This car was found about 15 years ago neglected and minus the original motor. When I found it, I already owned the first of these `Nichols Specials' (Now driven for me by JP Molerus) of France (currently running in the LA area.). We believe this is the third of the four Nichols built. It was original raced by Perry Peron (built at least in part by Stan Bucklin). After a little research I was able to contact both Jerry Fairchild and Dr. Bill Molle. After I restored the car, I was fortunate enough to be able to offer and have Dr. Molle drive the car at Laguna Secca on its maiden run after restoration. After Jerry passed away, Doc contacted me and said he had a gift for me -- and that I should come visit him one day. Several months later I paid him a visit and was stunned by the sight: he presented me the original Twin Overhead Cam motor that Jerry had kept for years (Jerry had passed away about 6 months earlier). Although I still have the motor (intact) and most of the fuel injection set-up, I have never tried to run it. Throughout the history of the Fairchild it was raced with various versions of Panhard power units. Among them include the Fuel Injected units as described in the `Sportscar Specials' book. It was also raced with a fuel injected twin overhead cam, one of a kind Panhard engine developed by Jerry Fairchild. This car was also run with a production supercharger as used on the Panhard Junior! Currently the car is run with a motor developed by Don Racine which is a copy of the motor as used in the Aardvark. Now for SALE- $25,000 OBO!" "Of the hundreds of Panhards built-up for racing, Dr.Bill Molle's is a standout. Winning the H-modified Division in California Sports Car Club's Pacific Coast Champion- ship two years in succession (1958-1959) is quite a feat..the competition is rough, rugged and fast. He also copped 2nd in H-modified standings in SCCA Regional awards in 1958, and Class H-modified number two spot in Motoracing's Pacific Coast Championship in 1959. Aside from the fact that Bill Molle is a leadfoot, the secret of this car's winning ways lies in it's Fairchild Panhard power-plant...the first successful fuel injected system for two cylinder, four stroke engines. Jerry Fairchild, designer of the system, is currently dickering with the French Panhard factory for manufacturing rights. The chassis, with tubular space frame and stressed inner paneling, was originally built by Perry Peron, and raced by him on West Coast events. The fiberglass body was designed by Murry Nichols, and later redesigned and rebuilt by Jim Byers, of El Segundo, California. Dr. Molle's reason for owning a special is, "To get maximum racing for minimum money, and to experiment with mechanical improvements." Engine: Fairchild Panhard, 2 cylinder 4-stroke, of 747cc (45 cu.in. ), fuel injected, running on a 9.5:1 compression. It develops 67bhp at 6,500rpm. Transmission: Four speed box integral with front wheel drive system, synchromesh 2nd thru 4th. Chassis: Multi-tube space frame with stressed aluminum panels. Front suspension is inde- pendent with two transverse springs,rear is semi-independent with `V' axle and flexible center housing, and six transverse torsion car, with adjustable Houdaille shocks all around. Steering is rack and pinion. Front brakes have aluminum drums, steel at the rear. at the rear. Fuel capacity six gallons. Performance: Top speed 118mph; speed at the quarter mile 84mph." saw running slicks on a road course. The car had 50 hp and turned 9000 rpm. 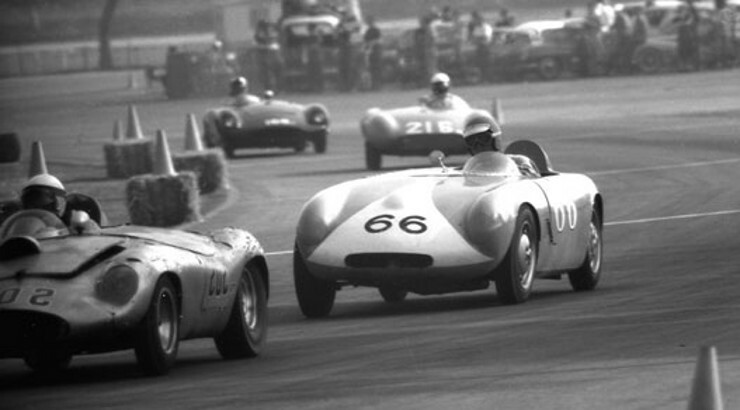 In 1960 his driver George Peterson was highly competitive with Dr. Molle and the other top drivers in the class. I know this car very well because I was in the pit crew. The body in this photo looks very rough because George Peterson flipped it in testing the day before the race. After an all-night session the car was patched up enough to run at Pomona. Lou Fageol got into the car because George was too beat up to drive. (Roll bars were very low in those days.) Lou was in his 60s at the time but he was still very competetive. On the first lap of the race Dr. Molle and Lou had a coming together in a fast turn and Lou ended up bottom side up in the haybales. I remember Lou in the pits after the accident with milk in one hand (for his ulcer) and trying to hold back Al Bond our mechanic with the other hand (who wanted to punch Dr. Molle’s lights out). The engine and transmission were pulled out after the race and I purchased the rest of the car as a project. This was my first race car, but now that I was fully employed at Santee automobiles I never got it on the track. Several years later I sold it. When it was running in a test session I got to drive it at Hourglass Field. This was my first drive in a real race car and I was hooked forever." "The #216 in the background looks like it could be Ingvar Lindqvist's Saab Double- Ender. I compared it against a photo in Vintage Motorsports magazine, March/April 1993, page 28. The body style is the same and both drivers are wearing white helmets with a tinted bubble shield."